So on Saturday, Syrian rebels in the east of the country attacked another government checkpoint along the Iraqi border, al-Ya`rabiya, and took it. Some of the besieged Syrian troops, many wounded, escaped to the Iraqi side and were being escorted by Iraqi troops south when they were ambushed early on Tuesday and 48 were killed, along with 8 Iraqi border guards. The attackers had rocket propelled grenades and left three vehicles burning. It is not clear if the attackers were Syrian rebels in hot pursuit across the border or if local Sunni Iraqi clans, who are related to the largely Sunni insurgents in Syria, struck for themselves. Alarabiya was reporting Tuesday morning Iraqi time that Iraqi tanks had advanced on the Free Syrian Army checkpoint at al-Ya`rabiya, presumably seeking revenge for the ambush. That isn’t a good sign, to have an Iraqi-Syrian border clash. The steps being taken by the US, as explained on Monday by Secretary of State John Kerry in Riyadh, to strengthen the Syrian opposition (by which he meant the moderates, not the Jabha) increasingly look too little, too late. Asthe Syrian rebellion grinds on, the most radical factions are coming to the fore in very worrying ways. It is not clear that Washington has the slightest idea what to do about this, though a new plan to arm moderates via Jordan in Syria’s southern district of Deraa may, behind the scenes, have American backing or at least the US isn’t vetoing it. (The Saudis are said to be buying the weapons and cooperating with Jordan in this effort because they are afraid of Jabhat al-Nusra and angry at Qatar winking at its growing prominence in the ranks of the northern rebels). Iraqi Prime Minister Nouri al-Maliki had warned just last week in an AP interview that if radical Sunnis come out on top in the Syrian civil war, they would be a source of profound instability in the Middle East and that Jordan and other neighbors could be dismembered. Shiite-ruled Iraq faces an on-going guerrilla war from radical Sunnis, some of them apparently now fighting in Jabhat al-Nusra in Syria. In addition, the Sunni Arab population of the west and the north of the country, about a fifth of the population, has been demonstrating peacefully against the al-Maliki government, with large rallies, for several months. Al-Maliki is afraid that if the Sunni radicals win Damascus, there will be severe effects on Mosul and Ramadi. Indeed, those effects may already have begun. To be fair to Iraq’s Sunnis, most of them voted for a secular party in the 2010 parliamentary elections, and many joined the ‘Awakening Councils’ movement against ‘al-Qaeda in Mesopotamia.’ And virtually no one thinks al-Maliki, a fundamentalist Shiite, has been good about reaching out to the Iraqi Sunnis or seeking national reconciliation. Then al-Qaeda affiliate Jabhat al-Nusra took the provincial Syrian capital of Raqqah on Monday. Raqqah was a place to which large numbers of refugees had fled, and most of the Free Syrian Army had considered it off-limits as a result. The Jabhat al-Nusra fighters still faced pockets of resistance around the Baath Party HQ. The opposition controls much of the countryside in Raqqah province, and had only lacked the provincial capital. The city is the first provincial capital to fall largely into rebel hands. 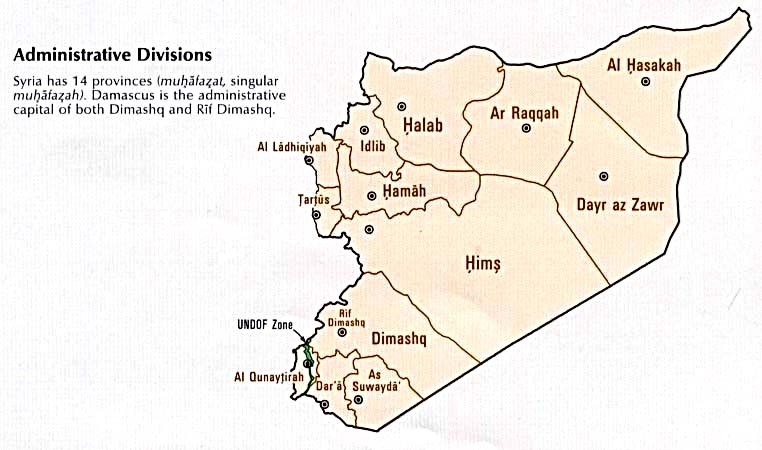 Syria has fourteen provinces, so the opposition has 13 to go (though to be fair, Syria is still 50% rural and the rebels control much of the countryside in the north). 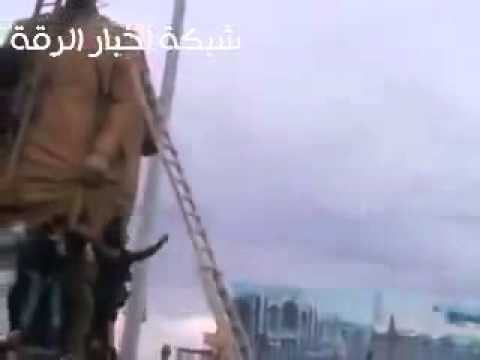 Video circulated on the internet of rebels pulling down a statue of Hafez al-Assad (r. 1970-2000), the father of current dictator Bashar al-Assad, who ruled Syria with an iron hand for thirty years. One fears that some of the excitement in the video is that of radical Sunnis happy to destroy a monument to a Shi’ite, Alawi secularist. So, I think you can largely color in Raqqah in the below map black (the radical fundamentalists like black flags). In the central depot town of Homs, the Syrian government on Monday waged a fierce battle to take back some districts lost to the rebels. Homs is key to the ability of Damascus to import supplies, ammunition and new weaponry from the port of Latakia and from the Russian naval base at Tartous. If the rebels ever take Homs, they’d be in a much better position to besieged, cut off, and take Damascus. Ironically, al-Qaeda in Mesopotamia wanted to take over a whole Iraqi province (it especially wanted al-Anbar, where it launched thousands of attacks in 2006-2007) but never was able to, in part because Sunni Iraqis turned on it when it killed their own sons for ‘collaborating’ with al-Maliki. But now Jabhat al-Nusra, with some of the same fighters in its ranks, has taken the Syrian province of Raqqah. And the Syrian brand of radical Sunnism is somehow implicated in a major attack on Iraqi soil. I think that al-Maliki is right, and that King Abdullah II of Jordan may not sleep very well tonight. Many Jordanian Salafis are said to be fighting in Syria, and no one knows what will happen when they come home. But with 6 dead Iraqi soldiers on his hands, it is al-Maliki who is most alarmed of all.